Much more than just another "retread" of a piece of gym equipment, the ThermoTread GT Treadmill Desk is designed from the ground up for today's offices. It's equipped with a smooth belt, a quiet motor, and an elegant touch screen controller. As the world's first smart treadmill desk, the GT will soon connect to the internet of things through the upcoming iMovR's CloudStation™, providing new usability and safety features for individuals and corporations alike. Welcome to the next generation of treadmill desks. The ThermoTread GT ships in a super-reinforced double box by freight carrier. The box alone weighs 44 lbs., which may seem excessive but given the number of LifeSpan and other treadmills we've seen damaged in shipping, excessive packaging is a very good thing. iMovR offers an excellent warranty on the ThermoTread GT, reflecting their confidence in the office treadmill's manufacturing quality. Unlike the reskinned gym equipment of yesteryear, the ThermoTread GT is built first for the office. A sleek touchscreen console tracks walking metrics, goals, and usage. Comes in with a better motor and walking deck than Lifespan's priciest TR5000. Budget-conscious deskers will have to decide if the future-proof features of the ThermoTread GT are worth the $650 jump from the TR1200. At $1,649, better specs, and the ThermoTread GT's "future-proof" touch-screen LCD desktop display controller, the iMovR ThermoTread GT is the top pick. The ThermoTread GT from iMovR is decidedly the most significant new product introduction we’ve covered since the inception of WorkWhileWalking. We’re sharing what we’ve learned from our time walking on and examining iMovR’s prototype. We’ve long been advocates of the LifeSpan Fitness TR1200 ($999) and TR5000 ($1,499) walking treadmill bases as being the best ones currently on the market for treadmill desk applications. iMovR’s ThermoTread GT comes $1,649, outperforming both units in many ways. First, the “clean sheet” design starts with the requirements of a productive office; earlier walking treadmills were merely “retreads” (pardon the pun) of existing gym treadmills that were essentially force fit into the office environment. iMovR’s design goals were what you’d expect: a smaller footprint, lower-profile deck, virtually undetectable motor noise, sensible power consumption, and true digital interfaces. Second, the ThermoTread GT was designed to be an appliance on the Internet of Things (IoT), tied to the cloud through the optional iMovR CloudStation™ (due out 2018). This connection allows iMovR to offer a host of updateable software features that will continue to propel the ThermoTread product line into the future. To be sure, the base model without the cloud connection option is still dramatically more evolved than its gym equipment retread predecessors, but especially for corporate buyers, connecting “smart furniture” to the iMovR Cloud™ will transform corporate wellness programs in a big way. For the corporate or high-end residential customer there is no contest; the ThermoTread GT far outshines the more expensive TR5000 and is sure to steal the crown for the corporate market that had previously been held by Steelcase, and more recently, Lifespan. For the more budget-sensitive buyer the question will boil down to whether the additional high-tech features, superior performance, and better warranty of the ThermoTread GT will compel them to spend $650 more for their treadmill base. Considering the number of hours the typical treadmill desker spends walking at their desk every week, we’d bet many will opt for the dream machine. For the purposes of this review we’re taking a different approach than our usual review style. We’re starting with a brief history of how the treadmill desk has evolved over the past eight years. It’s important to set the context for why we believe the ThermoTread GT marks the beginning of a new generation of office treadmills. IN THE BEGINNING (2007) there was the first treadmill desk, the Steelcase Walkstation. Priced at $4,995, the Walkstation combined a decent electric height-adjustable desk with perhaps the weakest of all walking treadmills ever. A roaring success among corporate buyers for a few years, eventually the Walkstation was eclipsed by higher-quality, lower-cost alternatives. Nevertheless, kudos to Steelcase for helping The Mayo Clinic’s Dr. James Levine – known as the godfather of the treadmill desk – to see his vision for an active workstation commercialized. About three years ago, LifeSpan Fitness threatened to take away Steelcase’s crown when they introduced the affordable TR800 ($799), TR1200 ($999) and TR5000 ($1,499) walking treadmills. Paired with an adjustable height table of just about any flavor, the cost of a good treadmill desk dropped by more than half. Tens of thousands of LifeSpan treadmill bases have been sold, making it by far the most successful product line for this relatively small Utah-based vendor of cardio exercise equipment. There have been a few “mom and pop” challengers along the way, like the TreadDesk and the RebelDesk. And cardio equipment powerhouses like NordicTrack and ProForm have thrown their hats into the ring with their own versions of the treadmill desk - but they belong in gyms, not offices. Even with all the new entrants LifeSpan appears to have held the lion’s share of the market since the introduction of their popular walking treadmills, and Steelcase hasn’t even noticed that their crown was stolen long ago. Based on our experience in selling the LifeSpan line, we estimate that the TR1200 has represented over 85% of the company’s sales. The TR800 is a low-end, Chinese-built unit - the noisiest, weakest and smallest of the trio, with the shortest warranty, but also the smallest footprint. For only $200 more, all but the most space-limited customers pass it up for the better value of a TR1200. The pricier TR5000’s self-lubricating belt and heftier motor position it, on paper, as the premier corporate choice. In practice however, the TR5000’s noisy fan - required to run continuously to keep its Watt-guzzling AC inverter cool – and the inevitable, expensive service call to replace the belt when its lubricating wax runs out often drive office buyers to opt for the quieter and easy-to-lubricate TR1200 instead. iMovR’s release of the ThermoTread GT represents a leap into the next generation of treadmill desks, and possibly even the office fitness industry. It marks the beginning of a transition from “dumb furniture” to “smart furniture” (the same kind of transition we saw with cell phones), where treadmill desks, standing desks and other office fitness aids will be continuously connected to the cloud. If you’ve been reading WorkWhileWalking’s reviews for a while, you’re probably already aware that horsepower is a meaningless indication of a treadmill's true weight capacity. Yet manufacturers insist on publishing this, and only this specification about their drivetrain’s capacity. Many other factors go into figuring how much weight a treadmill can support and for how long. These factors include frame strength, deck material and rigidity, belt friction coefficient and surface area, gearing ratio, flywheel size and weight, motor RPM, roller diameters, roller crowns and belt guides, to name but a few. 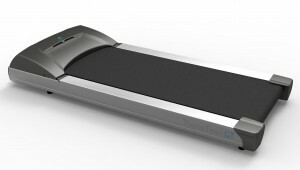 iMovR’s veteran treadmill engineering team designed the ThermoTread GT to outperform the TR5000 in every way – especially in the drivetrain department - while keeping the cost close enough to that of the TR1200 to win over value buyers on a budget (Editor's note: Lifespan has since considerably lowered the prices of their aged treadmills). Most treadmill manufacturers decide on what weight rating to publish based on their marketing departments' whim and fancy. Proper engineering involves the use of finite element analysis simulation tools followed by real-world testing. iMovR is the first treadmill desk manufacturer we’ve worked with who has actually supplied evidence of their testing methodology. The ThermoTread's 400 lb. weight rating was derived through real FEA and automated 24x7 simulated stress testing. We’ve asked numerous LifeSpan representatives how the company arrived at the different duty cycle ratings for their treadmills, but have only been told “this is how we position the units against each other.” The ThermoTread GT has no duty cycle limitations; it can be used continuously without worry of prematurely burning out any components. To be fair, in our experience it is extremely uncommon to hear of a field failure of either the LifeSpan TR1200 or TR5000, though the fleet is still relatively young. Part of the weight rating is also determined by the quality of the treadmill deck itself. Really cheap consumer treadmills will often use melamine boards, such as we find on the TreadDesk. Lifespan’s treadmills all use higher-quality phenolic boards. iMovR’s ThermoTread GT, however, is the only one on the market that uses the highest-quality board, made of Bakelite. The TR1200’s deck is only ¾” thick; the TR5000’s is 1” thick, like the ThermoTread’s, contributing to their higher weight ratings. It bears emphasis that proper lubrication is key for the optimal performance of any treadmill, and this is another area in which iMovR used LifeSpan's designs as a springboard for a small but important improvement in the ThermoTread GT design. LifeSpan's own recommendation for lubricating its treadmills (see their video) is to remove the motor enclosure hood in order to get your fingers under the belt to lift it and spray silicone oil underneath. Requiring tools to lubricate a treadmill is enough to dissuade many users from doing it as often as they should, namely after every forty hours of use, as a general rule. In contrast, the ThermoTread design allows for sufficient space between the side rails and the walking belt to make it easy to lift the belt without the need for tools, and dispense with lubrication in under a minute. iMovR's lubricant bottle design is also much more cooperative, spraying a pinpoint stream rather than a cloudy mist of silicone oil (see our full reviews of the iMovR EasySpray Treadmill Lubricant and LifeSpan lubricant). Dyaco is a Taiwanese cardio equipment manufacturer that produces a quarter of a million treadmills a year. Well-known Dyaco-owned brands in the US include Spirit, Sole, and Xterra. Though new to the treadmill business, iMovR will have Dyaco’s large US support and warranty repair organization behind it from the outset. Lifespan has their TR1200 and TR5000 models made by StrengthMaster, a much smaller Taiwanese cardio equipment manufacturer that actually owns the LifeSpan brand and licenses it to Park City Entertainment (Utah) for the US market. The ThermoTread GT is purpose-built from the ground up for walking in an office setting. Unlike running treadmills, whose components aren't attuned to walking speeds, ThermoTread's gearing ratios are specially optimized to deliver high torque at low speeds, which is ideal for walking. The result is a reliable, long lasting office treadmill. Just as important is the motor's noise signature. Noisy treadmills can be a nuisance in the workplace, particularly in small, personal offices. At just over 42 dB, the ThermoTread's whisper-quiet motor has the lowest noise signature of any office treadmill we've tested. Despite its robust weight, positioning the ThermoTread underneath a desk is easy, thanks to two wheels towards the front of the treadmill, underneath the motor housing. Simply lift the back of the treadmill and push or pull it into place. The ThermoTread's 20"-wide treadmill belt provides a spacious walking surface that allows for a varied gait—an absolute necessity for preventing leg and hip pain during bouts of prolonged walking. Its 52" belt length reduces the treadmill's footprint, allowing for more space behind. This feature is especially useful in a shared office environment, where you can expect a lot of foot traffic behind the treadmill. Aluminum side rails beside the belt provide enough space to safely stand when not walking, and match the office decor better than the more gym-oriented aesthetics of other office treadmills. Consumers pay a lot of attention to the desktop console design, and rightly so – it’s the business end of the treadmill desk. We’ve seen desktop consoles range from slim to bulky, from Toys-R-Us-like cheap plastic construction to weighted bricks. To date, all the ones we’ve seen share one common characteristic that belies their gym equipment heritage: membrane input keys. Great for sweaty runners who need a big button to hit safely, membrane input keys can be oversized and unsightly on the modern desktop. LifeSpan’s desktop console is no exception. The membrane keys can be frustrating to use, and require many more presses than should be required to restart the treadmill after pausing, but they get the job done. The console is functionally sufficient – other than the clunky Bluetooth sync-to-laptop button that has never worked properly. It displays the basics: speed, time, distance, step count and calorie count. But that’s where it ends. Aside from that long-standing Bluetooth sync problem, our only issue with the console is that some of the membrane switches have a tendency to break after heavy use. Track the Time Spent Walking, Standing, and Sitting. Set Break Times for Yourself Too! The ThermoTread GT employs a modern, touch-screen LCD desktop display controller with a variety of functions available right out of the box. In addition to controlling treadmill speed you can view your time, distance, steps, and calories spent, to give you a more complete picture of your walking activity throughout the day. Additionally, the console gives you the tools to track the time you spend sitting, standing, and walking, as well as providing a separate, programmable Pomodoro timer that alerts you when it's time to get on your feet again. Finally, you can personalize your own treadmill speed and timer preferences in your very own user profile, so you and everyone in your home or office can walk and work at your own pace, according to your own schedules. All of these capabilities combine to give you complete control of your work and your health. In addition to these features, all of which will ship with the treadmill, iMovR promises continuous releases of new features over time, just like a smartphone app. Software can be easily updated through the unit’s USB port. In the not too distant future, the GT’s console will be able to manage not just the treadmill but also a variety of upcoming electric desk and monitor arm options from iMovR. Imagine logging into your desk, hitting one of three buttons – SIT, STAND or WALK – and having the desk height, monitor height and treadmill speed all change to your preferred settings. Mode changes become instantaneous rather than requiring fifteen to twenty button presses as with a LifeSpan, or any other walking treadmill base for that matter. Treadmill desks in large enterprise environments today are ad-hoc occurrences. Individual employees or departments opt to buy them, but few corporations have made them easily available to any sedentary worker who wants one. iMovR is aiming to change this by getting these organizations to buy into treadmill desking at the top management level, and helping corporate wellness groups develop programs to promote the appropriate use of treadmill desks within every department that employs sedentary office workers. Where other vendors have sought to sell treadmill desks to pioneering employees or departments scattered throughout an organization, iMovR’s comprehensive enterprise sales strategy is to convert the culture within corporations to eventually make treadmill desking as popular as standing desks have become, within the next ten years. To facilitate this they have been developing the iMovR Cloud infrastructure and the optional iMovR CloudStation™ add-on device that will be coming out in 2018, to connect treadmill desks, standing desks, desktop workstations and other "NEAT devices" to the internet. Once connected there are a host of software features that large enterprise customers will be able to utilize. iMovR intends to offer these features free of charge to their customers, enabling both their own equipment as well as competitors’ treadmills to be connected to the cloud real-time. More about that in a later review update. 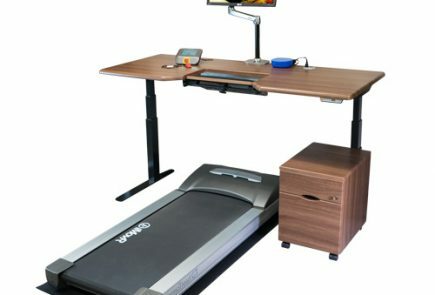 It has always struck us as deeply ironic that law firms are amongst the earliest adopters of treadmill desks, yet their in-house, esquire kin have a tendency to block the installation of treadmill desks for other employees’ use over fear of potential liability should an employee or visitor get injured on one. See our article on What Legal Departments Need to Know About Treadmill Desks. iMovR has done something with their smartphone-like desktop console that is sure to satisfy the liability concerns of even the wariest lawyer. They’ve incorporated a “click wrap” liability waiver, just like the GPS navigation system in your car, right into the log-in process. It is therefore impossible for anyone to power up the treadmill without a) identifying themselves by logging in with an established user profile, b) clicking to approve the liability waiver, and, with the optional CloudStation device, c) having their preferred settings downloaded from, and usage stats uploaded to, the iMovR cloud. No other treadmill desk manufacturer has the ability to capture a click-wrap liability waiver agreement from every user before powering up. This one feature will make the ThermoTread GT a hands-down choice for many corporations, to be certain. Standalone Treadmill Base or a Complete Treadmill Desk System? Lifespan tags their walking treadmill bases with the “-DT3” suffix when sold standalone, without one of LifeSpan’s very limited selection of two gym-styled desk units: the manually-adjustable -DT5 or the electric height-adjustable -DT7. The $999 TR1200-DT3 has been the most common treadmill base bundled with other manufacturers’ desks, which tend to come in a wide variety of sizes, colors and capabilities. In fact, since iMovR’s launch of their original ThermoDesk line, and especially their newer Omega line of desks with embedded SteadyType™ keyboard trays, there has been no better combination of treadmill desk equipment than a LifeSpan base and an iMovR desk. With iMovR’s introduction of their own treadmill unit, the ThermoTread GT, we predict many users will want to opt for an all-iMovR setup. That said, we still think we're going to see a fair number of TR1200 + iMovR desk combination systems sold to the most budget-conscious consumers. We expect we’ve seen the last of the TR5000 + iMovR desk combos, as the new $1,649 ThermoTread GT runs circles around the TR5000 unit. The LifeSpan TR1200 and TR5000 are "retreads" of the TR1200i and TR5000i running treadmills, with some slight modifications. They are well-built, for certain - better than Steelcase, Rebel, TreadDesk and all the others that came before the ThermoTread - but the design of these units did not take into consideration office space requirements and treadmill desking ergonomics. For example, the ThermoTread GT is dramatically quieter (by 6-7 decibels at all ear positions we measured at 2.0 mph), is three inches shorter, and has a lower step-up height than the TR1200 and TR5000. Whereas the TR1200 does not have a cooling fan, and TR5000 includes one only on its AC inverter (quite loud and annoyingly, always on), the ThermoTread GT includes a whisper-quiet cooling fan that is always on when the treadmill is in use. A cooling fan can significantly improve component life, but a noisy one can distract and fatigue office workers after a while. We were pleased to see that the ThermoTread GT includes a cooling fan, even though you'd think it doesn't judging by its barely perceptible noise signature. While the motor rating is the same as the TR5000 - 3.0 horsepower - the overall drivetrain is much better tuned to the high-torque-at-low-speeds requirement for office treadmill application. Gearing ratios were optimized for the 2.5 mph maximum speed of the ThermoTread GT. As you are probably already aware if you’ve been researching treadmill desk equipment, horsepower is a meaningless indication of a treadmill's true weight capacity. Many other factors such as frame strength, deck strength, gearing ratio, flywheel size and weight, motor RPM, roller diameters, deck and belt friction, etc., all go into the equation. iMovR's clever design of the ThermoTread GT drivetrain avoids the use of a costly, heavy and loud AC motor like the one used in the TR5000. The bonus in doing this (besides lowering the cost of the treadmill significantly) is more power efficiency. In our lab testing the ThermoTread's power consumption landed right in between the TR1200's and the TR5000's. The deck thickness and material is another important differentiation between the iMovR treadmill and the LifeSpan units. iMovR is the only manufacturer of treadmill desks to have upgraded to a 1" Bakelite material, which outperforms the 3/4" and 1" phenolic boards used by everyone else. The GT employs an elegant, "future-proof," touch-screen LCD desktop display controller rather than the gym-styled, limited functionality membrane keyboard display controller found on all other treadmill desks on the market, including the LifeSpans. The console can control not just the treadmill but also a variety of ergonomically-optimized ThermoDesk and Omega height-adjustable desks that iMovR will be introducing over the coming year. Internet Connectivity Using iMovR CloudStation™, real-time connectivity to the iMovR Cloud. Uplinks user and machine performance, downlinks user preferences (for treadmill and desk settings), and numerous other advanced software features expected in 2018 Only through a highly unreliable Bluetooth Link, only provides very basic one-way info to a PC. Only through a highly unreliable Bluetooth Link, only provides very basic one-way info to a PC. Console Dimensions 8" x 7" x 6" 12.5" x 3" x 2" 12.5" x 3" x 2"
Walking Belt Area 20" x 52" 20" x 56" 20" x 56"
Deck Height Under 5" 6" 6"
User Weight Rating 400 lbs. 350 lbs. 400 lbs. Boxed Dimensions 79.5" x 42" x 15" 73.5" x 30.6" x 11.4" 73.5" x 30.6" x 11.4"
It's worth mentioning iMovR's EcoLast TreadTop Standing Mat as a great add-on for the ThermoTread GT, or any office treadmill for that matter. When you want to take a pause from walking the last thing you want to do is stand on the cushion-less hard deck of a treadmill for very long, lest your feet start to suffer. These TreadTop mats are premium-quality, 100% polyurethane standing mats that are cut to size to specifically fit popular office treadmill models. They can be used atop the desk or astride the treadmill if you have a sit-stand-walk workstation, or both. Be sure to check out our 5-star review of the TreadTop Anti-Fatigue Mat. You'll want the 20" x 32" version designed specifically for the ThermoTread GT. The ThermoTread GT ships in a super-reinforced double box, on a 55 lb pallet, by freight carrier. The box alone weighs 44 lbs., which may seem excessive, but given the number of LifeSpan and other treadmills we've seen damaged in shipping, excessive packaging is a very good thing. As a consequence, however, the shipping cost is a bit higher than for other models. The treadmill, box, and pallet together weigh approximately 250 lbs. The ThermoTread GT office treadmill base including the touchscreen-LCD desktop console is priced at $1,649, and is now shipping. I own one of these. Not affiliated in any way with the company. I picked it because it was the smallest and quietest, but my major reservation was the top speed of 2.5 mph. I am a fast walker. I usually walk 4mph or so down the street. Would 2.5mph be too slow? Bottom line: I LOVE it. Quiet (can’t even hear it outside my office), great controls that are not annoying, easy setup, feels and acts super-solid. I’m walking on it now as I type this. The top speed concern was completely mistaken. It turns out that for me at least, my walking speed in going down the hall has nothing to do with the proper walking speed for typing or mousing. Right now I am walking at 1.3 mph and that is perfect. Just breaking a tiny sweat (I walk in my business clothes) and have high accuracy. Even on day 10 I can walk for hours. I tried turning in up to 2.5 mph and this is MUCH TOO FAST for me. Other people who get on and walk even at 1.3 say “Whoa, that is fast”! Of course it is not but the experience when you are trying to to stay close to a desk and type comfortably is very different from free walking. Of course if you are looking to watch movies or something it might be different for you, but I wanted to work and type while walking. 2.5 mph is PLENTY.